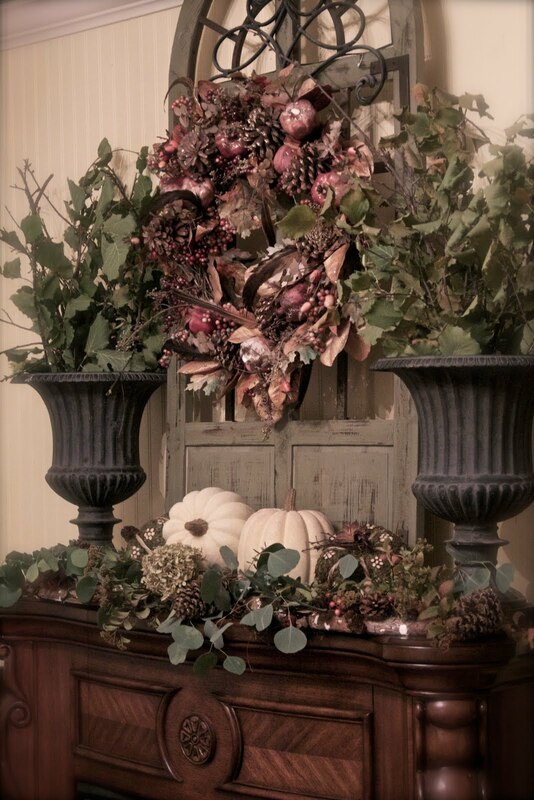 Southern Living decorated mantels always inspire me. Full, elegant, natural... I love them. This year I was thinking a more natural Autumn mantel for the bedroom. and while on walks with my daughter. they are wonderful in the urns and their leaves are a fantastic shade of green. The arched 'window' was a Home Goods find. covered in muted tones of the season. will be sharing it soon. Hope everyone had a fantastic weekend!! It looks so pretty and elegant! I love the natural look, Courtney. I'm a big urn fan, so of course I love those. You've created a beautiful vignette. I often find things around me to use as decoration too. This is prettier than anything I've seen in a Southern Living Magazine in a long time! They should hire you! Beautiful inspiration! P.S. Checkout my giveaway I have going on this week! That is beautiful! I love the arched window as a backdrop. Most people don't pay enough attention to the master bedroom (when i say most people, I mean me!!) so it's refreshing to see that you started there first! Love it! Perfect! 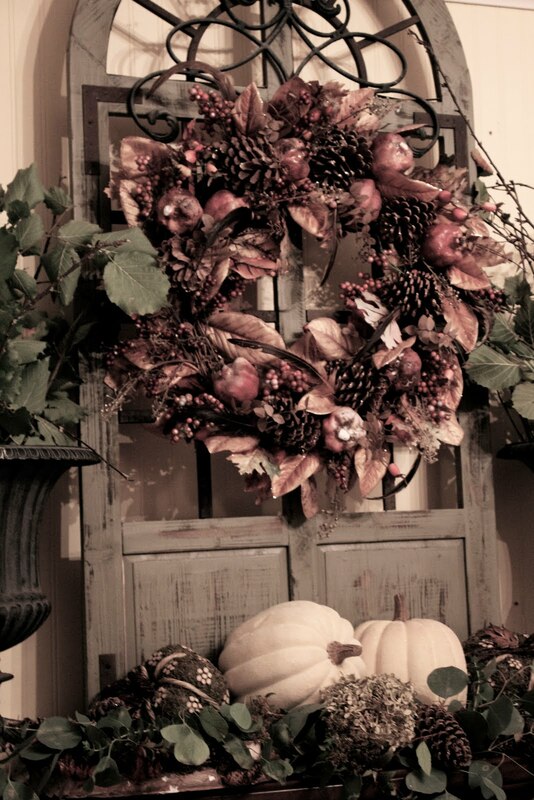 Love the use of natural things for seasonal decorating. Yep, Southern Living is very inspiring! Love, love your mantle! Your use of the muted tones is very pretty! Thanks for sharing! You make Fall look amazing! Courtney, I love this mantel! Isn't it great to be able to just step outside and find so many natural elements to incorporate into your decor? This looks beautiful! So natural and rich looking! Beautiful! I fell in love with this as soon as I spotted the real branches! Beautiful, Courtney! Its natural and elegant Courtney, just gorgeous! Thanks for visiting and your kind words. I'll definitely try to remember to link up on Fridays. You've got a good party going. Your mantle looks beautiful. I love the window or door that you've used as a backdrop. I'm envious of your ability to go out side and pick eucalyptus. I have family in Ca. and love how many of my favorites are year round there. I like the combination of pale greens with the white pumpkins, maybe add some sparkly crystals & candlelight. Courney - Love the mantel and all the natural elements. Really love the urns also. Thanks for stopping by my blog and leaving such a sweet comment on my fall porch. I will definitly be back for the Featherd Nest Friday Party, and back later to look around. Enjoy your week. Beautiful mantel! And, i love the cute eucalyptus tucked in there. I bet it makes the room smell wonderful! So very pretty!! Pinning on my "fall inspiration" board! Courtney, I love your mantle. It looks so elegant, I love the natural things you used to complete the look. I love it. I wouldn't change a thing. Home goods is the best. I would have nabbed that neat window in a heartbeat, Courtney, it's awesome! Your urns are also great. Take care and enjoy your week. I love it! The urns are so fallish and I love the arched homegoods find. Very pretty soft and faded fall mantel. It reminds me of faded old velvet. So elegant! I love your mantel! I do love your white pumpkins! I love the look of this Courtney! The window as the centerpiece is great with the wreath on it~very pretty!! Your mantel is beautiful. 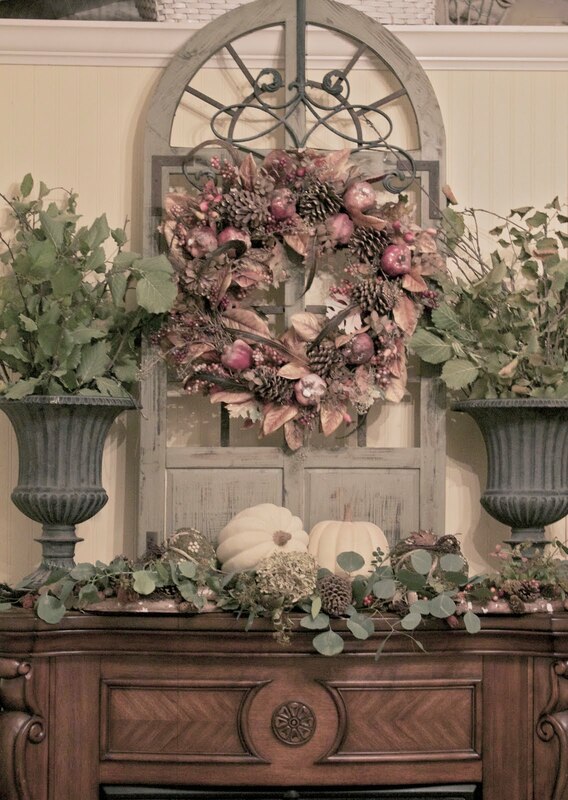 Love the urns and the window frame and what a gorgeous wreath. Ohhh my gosh, Girlfriend...I think your bedroom's autumn mantel is GORGEOUS!!! I love the soft, muted colors! 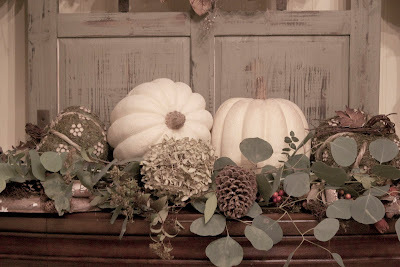 The white pumpkins, soft green leaves, and mossy pinecones are my favorite!!! Love, love, LOVE the arched window too! My friend, you are such a gifted designer! I always love coming to your place...you inspire me everytime!!! Thank you!!! Courtney, I definitely have mantel envy. Simply stunning, my dear! Love your mantel Courtney! It is gorgeous! Looks beautiful, Courtney! I love the pumpkins nestled into the eucalyptus. Well my friend, I just had to come over to let you know that I just seen the article about French Country Cottage in my latest issue of Romantic Homes magazine. It just came in the mail yesterday. I was thumbing through it when I seen the photo of your fabulous frenchy bedroom...and thought...hey, I recognize that room! Hehe! It's on page 12. How very exciting, dear friend! Congratulations!!! I'm just tickled pink for you! Very beautiful, Courtney. 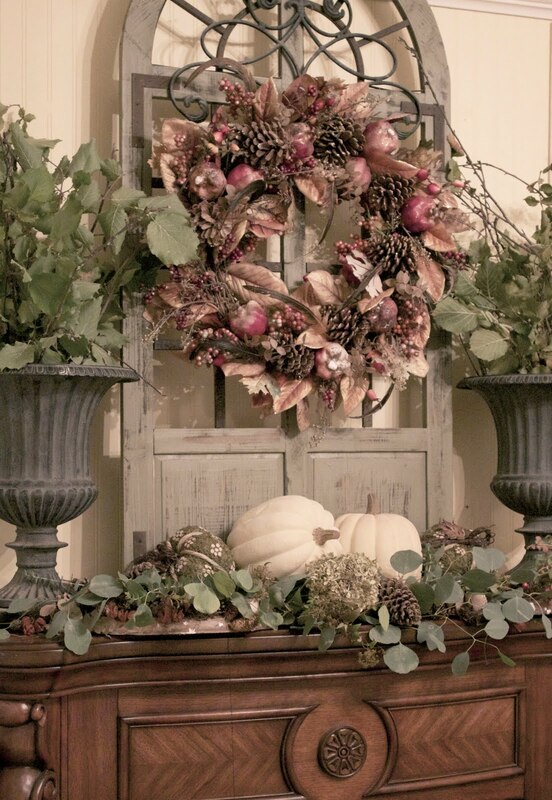 I love, love the "window" with the wreath. Months ago, I saw a similar window at Hobby Lobby and didn't buy it that day. Of course it sold before I went back and I've always regretted it. Seeing how you put yours together makes me wish I hadn't been so cheap that day! You did a great job of literally bringing the outdoors in. I love to see decorating like this that looks so elegant, but doesn't cost a lot to pull together. So pretty Courtney...especially love the window as the back drop! Also, congrats on the Romantic Homes feature...I saw you on the blog love/site seeing section! ;-) Made me smile! Eucalyptus is one of my absolute favourite. I planted one in our garden a couple of years ago.Apparently you can cut them down small every year, and the leaves stay that gorgeous grey-green. That's my plan anyway! 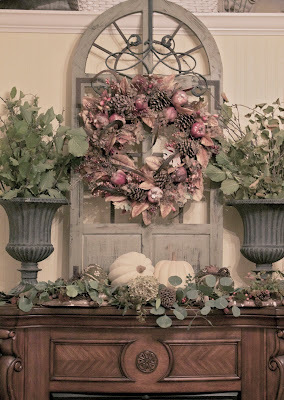 Thank you for linking up again to Modern Country Style's Fall In Love link party! Your beautiful home just smiles Autumn:) Wonderful job! I love those urns on the mantel. It all looks so lush and full. Really pretty! I like the symmetry and balance of the display! 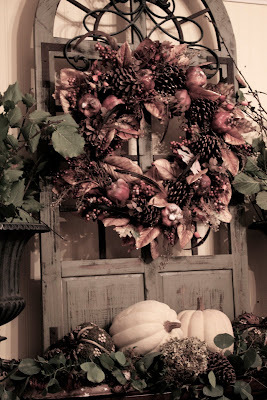 Thanks for linking up to The "Autumn Décor" Talent Scouting Party at WhisperWood Cottage! Oooh, I think the mantel is beautiful! I love the abundance of natural elements, & that window is such a perfect backdrop.